All delivery charges are subject to GST. We do not deliver to West Kelowna, East Kelowna, Upper Mission, UBCO, Quail Ridge or Ellison. If you request a specific cold beer or wine liquor store pick up, your base rate delivery charge automatically starts at $14.50 for the first 3 KMs and $1.00 for each KM after that. A specific pickup from the Government store will automatically start at $16.50 for the first 3 KMs and $1.00 for each KM after that. Specific stops will only be accommodated when time permits and is at the discretion of Drinks Delivered. Our goal is to get you the least expensive, coldest beverages to your door FAST. The fee for an extra stop reflects the time it will take to pick up specific products above and beyond the original pick-up location. We always ask you for a second choice, just in case the original location doesn’t carry the product you’re asking for. If you don’t have a second choice, then you are giving us the “OK” to go to a second location for which you will be charged an additional fee. We accept cash, credit cards and debit through our fast and secure wireless debit terminals. We do NOT accept cheques, money orders or prepaid credit cards. **for purchases over $200, a 3% fee will apply for credit card transactions. 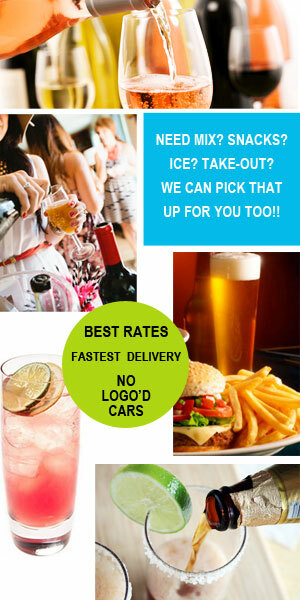 Drinks Delivered offers a convenient on-demand delivery service right to your door. We deliver product to you FAST, but we have NO control over the price or product availability at any store. We have the most drivers covering the city to get your delivery to you as fast as possible! We say 35 - 45 minutes, but most of the time, we're even faster!! Your patience and understanding is appreciated, as SAFETY for our drivers is paramount.